Partial aerial view of Camp Bowie, Brownwood, Texas, where the 10th Field Hospital was activated 6 July 1942. The site was an Armored Division Camp with a total acreage of 116,264 and a troop capacity for 2,237 Officers and 43,247 Enlisted Men. 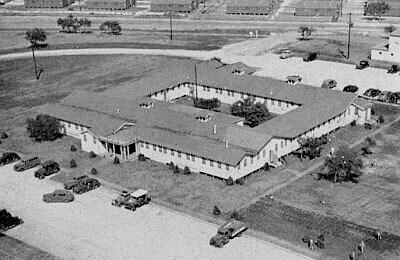 The 400-bed 10th Field Hospital was constituted on 23 June 1942 and activated 6 July 1942 at Camp Bowie, Brownwood, Texas (Armored Division Camp; total acreage 116,264; troop capacity 2,237 Officers and 43,247 Enlisted Men –ed) and served in both the North African, Mediterranean and European Theaters of Operations during World War II. ) and served in both the North African, Mediterranean and European Theaters of Operations during World War II. It participated in eight important battle campaigns, and returned to the Zone of Interior after the end of the war in Europe. The 10th Field was finally inactivated at Camp Myles Standish, Massachusetts, on 4 November 1945. 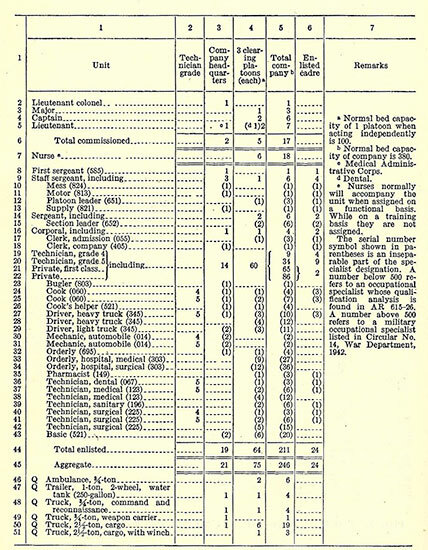 Copy of T/O & E 8-510, for a 400-bed Field Hospital, dated 28 February 1942. Changes in organization were gradually introduced and in comparison with 1942, T/O & E 8-510, dated 28 September 1943, numbered 22 Officers, 18 Nurses, and 230 Enlisted Men, i.e. an aggregate personnel strength of 230. Eventually re-organized on basis of T/O 8-510 dated 28 February 1942, the Hospital consisted of a 1 Headquarters and 3 Separate Platoons, designated Hospitalization Units. The staff and personnel included 17 Officers – 18 Nurses – and 211 Enlisted Men, reaching an authorized strength of 246 personnel. It should be clear that Nurses normally would accompany the unit when assigned a functional basis. While on a training program, the ANC Officers were not assigned to the unit (although there were exceptions). The authorized complement of vehicles included: 1 ¾-ton weapon carrier – 3 2½-ton cargo trucks with winch – 4 ¾-ton command & reconnaissance trucks – 4 1-ton 250-gallon water tank trailers – 6 ¾-ton ambulances and 19 2½-ton cargo trucks. Evacuation capacity for the ambulances was either 7 men sitting or 4 men recumbent, while the weapon carriers could hold 8 men or 4 recumbent (with inserts), and cargo trucks 17 men sitting or 18 recumbent. In addition to the special training peculiar to the US Army Medical Department, the medical unit was expected to participate in practice marches, drills, and maneuvers, and training as conducted by the United States Armed Forces to which it was either attached or of which it was an integral part. Partial view of New York Harbor during World War Two. All Enlisted personnel received training to become proficient in basic military subjects as prescribed by the War Department. Technical and Tactical Training were equally provided which usually included all of the special training and instruction required to perform in both the administrative and the technical services. Training of divisional medical units and attached medical personnel was based on a 13-week Mobilization Training Program (MTP). The Tactical Training included logistical movement of the medical unit and operation and function of the various medical installations in the field, during combined field exercises and under simulated combat conditions. Practical training was also conducted while serving at Camp Bowie’s Station Hospital. The Medical Department used the new Mobilization Training Program 8-1 published by the War Department on 18 February 1942 (based on a 13-week detailed program) which was to be applied at Medical Department Unit Training Centers. A separate MTP 8-5 was used as a substitute program at the Medical Replacement Training Centers and only included 11 weeks of training. It was also stated that all EM were required to have 2 weeks of Basic Training before they were assigned to Specialist Schools. An additional Mobilization Training Program MTP 8-10 was to be issued for training of Specialists of the Medical Department by end 1942, early 1943. Unidentified American troops board the USAT John Ericsson, the transport that carried the 10th Field Hospital to French Morocco early March 1943. As far as known, the 10th Field Hospital sailed from New York harbor 3 March 1943, aboard the USS John Ericsson (ex-MS Kungsholm, built in Germany in 1928, operated by Swedish-American Lines, confiscated while in New York in December 1941, and sold to the US Maritime Commission for use as a troopship, served in the Pacific, the Mediterranean, and the European Theaters until 1945 –ed), part of a large convoy of ships with destination North Africa. She reached Casablanca, French Morocco, without any problems, arriving on 18 March 1943. 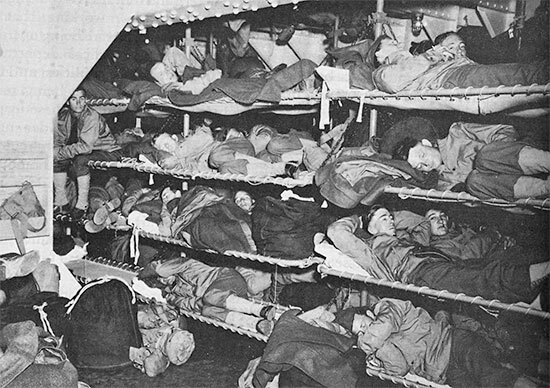 Vintage photo illustrating the Enlisted Men’s accommodation aboard US military transports during the war. Note the many tiers and the limited space. 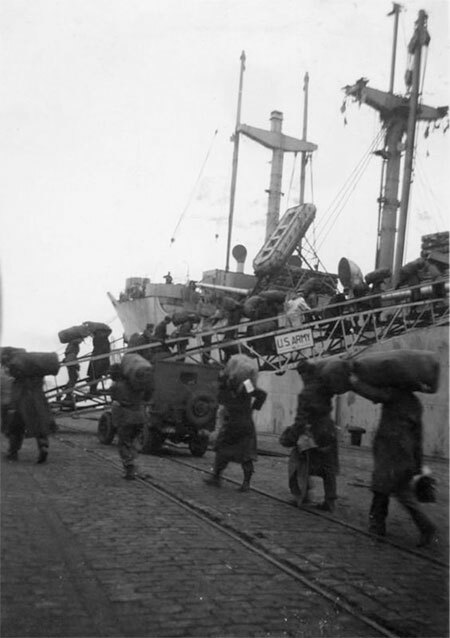 After a short break following debarkation on 19 March 1943 in French Morocco, the organization awaited orders for further movement and meanwhile trained for any forthcoming operation. The 10th Field Hospital newly arrived in North Africa eventually reached Tabarka, Tunisia, on 30 April 1943, and was assigned to II Corps. The unit however did not go into operation until 7 May, when it was used exclusively as a holding unit for air evacuation, and to serve personnel of a nearby air base. One of the reasons was that II Corps had really dislodged the enemy from his best positions and he was now left fighting on the edge of the high ground, with lower rolling country behind him and Mateur, thus favoring full use of Allied armor toward Mateur and Bizerte, Tunisia. German retreat became thus inevitable. During the drive to Bizerte, medical evacuation was particularly difficult because of the terrain. Mules were often used for litter carry as well as regular hand litter carries, with additional personnel being drawn from line troops. In the final weeks of the campaign, medical support of the combat forces improved as the coastal plain was more adapted to easy movement of vehicles and the existing road net was good. Moreover Evacuation Hospitals were set up close by. In May 1943, the 10th Field had moved to Souk-el-Arba, Tunisia, except for the Third Hospitalization Unit which was established at Montesquieu, Algeria. Allied Conference, Casablanca, French Morocco 14-24 January 1943. Left: US Army Color Guard. Right: President Franklin D. Roosevelt (1882-1945) and British Prime Minister Winston L. Churchill (1874-1965) during one of the many press conferences and interviews in Casablanca. Air evacuation took place by C-47 aircraft from Souk-el-Arba to either Algiers or Oran, in Algeria. Between January 1943 and May 1943, some 474 patients were carried to Algiers and 650 patients transported to Oran. Training of all medical personnel involved in Operation “Husky”, the Invasion of Sicily, took place at the Fifth United States Army Invasion Training Center, Arzew, Algeria. 22 May 1943. Air Evacuation out of Tunisia. A litter patient is loaded aboard a converted C-47 cargo plane. The standard chain of evacuation from the battlefields in Tunisia went by road and rail, while air evacuation took the patients directly to fixed Army Hospitals in Algiers and in the vicinity of Oran, both in Algeria. Medical units were often exclusively used as holding units for air evacuation or to serve personnel of an Allied Air Base. 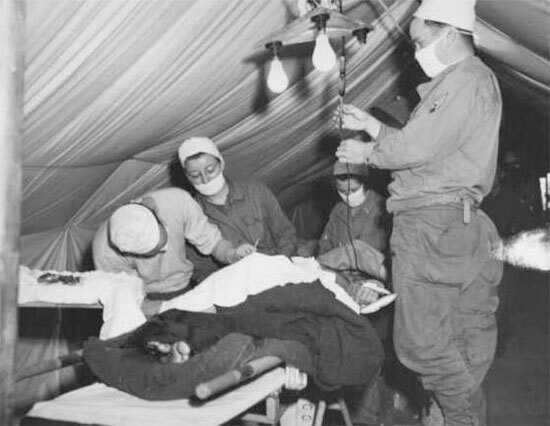 The First and Second Hospitalization Units of the 10th Field Hospital served as a holding unit at Souk-el-Arba, Tunisia, preparing patients for air evac from Tunisia to Algeria (period 16 January 1943 – 23 May 1943). The overall strength of US Army Forces included the organic Medical Battalions (divisional units or separate units), the attached medical units (separate Medical Battalions or Companies), the Field Hospitals, and the specially attached Auxiliary Surgical Teams, all scheduled to land with the assault troops! Additional Evacuation Hospitals were expected to land on D + 4. The 10th Field Hospital, assigned to the “Joss Force” landed at Licata, Sicily, following their combat units ashore within only a few hours, and opened for operations on D + 1. Troops in the Licata Beachhead moved rapidly and while medical installations kept pace, only a few elements pertaining to the 56th Medical Battalion, Separate (arrived MTO 8 November 1942 –ed) were left at the beach to handle any evacuation of patients from the island. Now operating in the northwestern sector of Licata, the 10th Field, supplemented by one Platoon of the 11th Field Hospital, and the complete 11th Evacuation Hospital were to serve the three US Divisions operating under Major General Geoffrey Keyes (designated Provisional Corps to differentiate from the regular II Corps –ed). These units were the 3d Infantry Division – the 2d Armored Division – and the 82d Airborne Division. Nine (9) surgical teams of the 3d Auxiliary Surgical Group (arrived MTO 16 February 1943 –ed) accompanied the landing elements; other medical units included 1 Collecto-Clearing Company from the 51st Medical Battalion, Separate (arrived MTO 11 November 1942 –ed) and 1 Ambulance Platoon from the 36th Ambulance Battalion. Sicily, 26 July 1943. 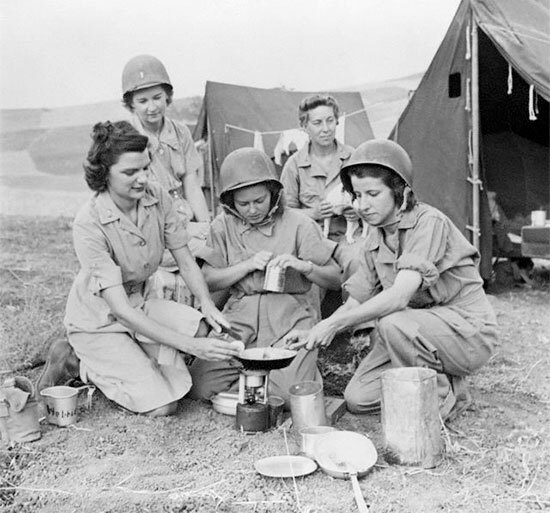 Photo illustrating some ANC Officers pertaining to the 10th Field Hospital, while indulging in some basic field cooking. The Provisional Corps overran the entire western end of Sicily in roughly one week, and so rapid was the advance and so disorganized the enemy opposition, that US forces captured Palermo without much effort. The only problem was that this rapid movement caused difficulties for the medical units which had to change position frequently in order to cope with the advance. The 10th Field shifted from Licata to Agrigento on 19 July 1943, where it was joined the following day by the holding unit of the 56th Medical Battalion. The organization then moved on to Corleone along the 3d Infantry Division’s line of advance on 22 July. Meanwhile forward divisional elements were already in the city of Palermo, some 25 miles away. The 10th Field Hospital would subsequently set up in Cefalu early August, and in Barcellona around mid-August 1943. The method used was leapfrogging by the three Hospitalization Units. In September, the organization was established in Palermo, APO # 758. Copy of vintage map illustrating the Salerno Beachhead, dated 14 September. Operation “Avalanche” took place 9 September 1943 with the purpose to tie down as many enemy troops as possible, acquire additional air bases for attacks against Germany, and seize the important Foggia air base as well as the vital port of Naples. In total the troop list called for 9500 mobile beds and 7000 fixed beds. Additional mobile medical units were to follow the landings in Italy within some 45 days by six 500-bed Station Hospitals and four 1000-bed General Hospitals. The units would be supplemented by 9 teams pertaining to the 2d Auxiliary Surgical Group (arrived MTO 11 November 1942 –ed). In view of the risks involved, it was planned that Nurses were only to come in on D+2. As such, the 16th Evacuation and 95th Evacuation Hospitals would go in together with the D-Day convoy, without their ANC complement. Initial landings started in the early morning of 9 September 1943. Although the unconditional surrender of Italy was announced over radio to the Allied troops a few hours before the assault, the hazards of such landing on a single and narrow beach remained high as veteran German Forces were on full alert in the area. Despite the number of hospitals ashore, beds were too few during September as many units were slow in getting into operation because equipment had been lost or delayed. Also, the rapid troop buildup caused heavy demands on medical facilities and with it came other problems such as a higher than expected rate of malaria. Medical operations in Italy. Left: Patients arrive at a Fifth US Army Clearing Station, November 1943. Center: Clearing Station of the 85th Infantry Division, Italy. 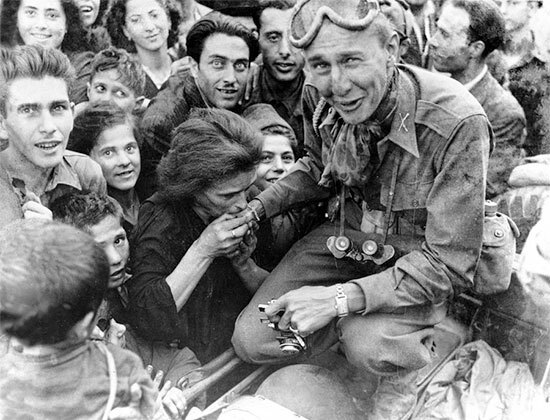 Right: Italian civilians help carry a casualty down a mountain trail. During Fifth US Army operations, all evacuation out of the combat zone was to North Africa. Evacuation took place either by sea, from the Salerno Beachhead, or by air from Naples, Italy. Around the end of September 1943, a violent storm leveled the tents of the 16th Evacuation Hospital and severely damaged the installations of the 95th Evacuation Hospital. Other hospitals, still without equipment and supplies had to borrow from other still inactive units such as the 56th Evacuation; this was also the case for the 8th Evacuation Hospital which had lost its equipment by enemy action! 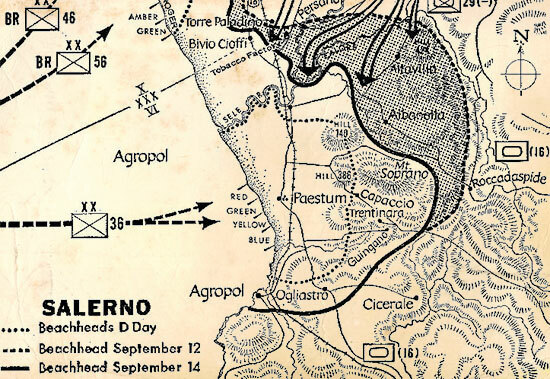 Following the breakthrough, Allied troops advancing to the Volturno River were now delayed by mountainous terrain and by expert demolitions effected by the retreating Germans. Nevertheless, Naples was liberated without opposition on 1 October 1943, and by 6 October Allied forward elements had reached the Volturno, where they immediately started bringing in heavy equipment to replace the destroyed bridges. By 15 November 1943, Fifth US Army had reached another enemy defensive position, designated the “Winter Line” (a kind of buffer in front of the formidable “Gustav Line”). Meanwhile the 10th Field had moved to Caserta since 29 October where it functioned as an Evacuation Hospital, and where it was established together with the 8th Evacuation, the 16th Evacuation and the 38th Evacuation Hospitals. Heavy casualties of the “Winter Line” campaign, linked to transportation difficulties because of the muddy and congested roads, the difficult terrain, and bad weather, required additional medical facilities. It became therefore necessary to bring in more hospital beds into the combat area. The 10th Field eventually moved from Caserta on 1 December, where it joined the 94th Evacuation Hospital on a site beyond the Volturno River, northwest of Capua (some four miles southeast of Mignano –ed) by 28 January, where it was still operating by 15 February 1944. The winter stalemate offered some relaxation from combat conditions although most medical installations suffered more or less damage during the New Year’s Day storms and the bad weather in the region. The unit was ready in a new site as from 3 March 1944, having left Mignano by motor convoy. The 10th was set up and ready to receive patients 4 hours later, despite the muddy area. It rained so hard that it became necessary to haul some gravel for the wards and the walks. An important development in late 1943 – early 1944, was the more consistent use of Medical Clearing Companies (organic subunits of the Medical Battalions) for hospitalization. 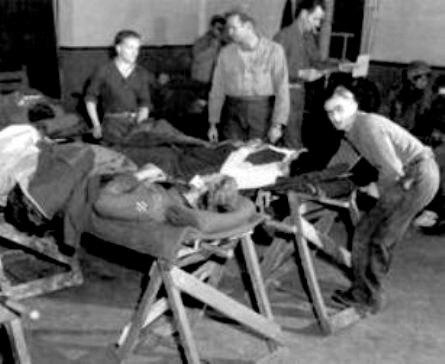 Since applicable to other hospitals, the 10th Field was also given an expanded Medical Clearing Platoon pertaining to the 161st Medical Battalion (former 1st Battalion, 16th Medical Regiment, arrived MTO 8 September 1943 –ed) where it served as a kind of convalescent ward, thus augmenting the organization’s medical capacity. Following its liberation, the British 7th Armoured Division occupied Naples without opposition on 1 October 1943. Local women welcome and kiss one of the first GIs to enter the city. Between December 1943 and January 1944, some hospitals, designated for the Anzio operation were closed and replaced by other units. Due to the hazardous conditions on the Anzio Beachhead (German air raids and long-range artillery shelling –ed), some of the above units had to be relieved or replaced by other Army Hospitals. Early 1944, the 10th Field continued to support the Fifth US Army at Cassino (January 1944); Carinola (April 1944); Casanova (May 1944); and Cellole (May 1944). By 2 February 1944, the aggregate number of available beds under Fifth US Army control reached 1750. By the end of March 1944, figures were up to 2350 beds and would reach up to 3500 before the Beachhead breakout of 23 May. On 9 March 1944, the arrangement of the hospital tentage was changed to the more convenient “cross style” mode. The change was implemented without disturbing the patients present in the wards. There was some experimentation with a field-type Italian operating room the last five days of March to see whether it would be a practical addition. In the end it proved unsatisfactory by the surgical team on duty because of insufficient room to operate (it was taken down on 5 April). For recreation purposes, there was an ample supply of movies, PX items, and organized athletics which helped boost morale among the troops. Two wards were now pitched together side by side, leaving 3 separate OR on one side and enough space to store operating supplies and equipment on the other side. The floor was covered with fine gravel. A squad tent was erected for experimental purposes. Following realignment of the Allied Armies in Italy after the winter stalemate, medical installations were moved accordingly to positions as rapidly as they could be cleared. Meanwhile, patients were evacuated to base hospitals in the Caserta area, the hospitals in Naples being mainly reserved for Anzio casualties and those of the French Expeditionary Corps. The 10th Field opened in the Carinola area on 3 April 1944, followed by the 16th Evacuation on 16 April, and the 3d Convalescent Hospital on the same day. By 11 May 1944, the 10th Field Hospital had moved to Casanova, where the 93d Evacuation Hospital was also established. On 29 May, the 10th Field relieved the 11th Field Hospital and following this change of units, personnel from the 10th were attached to the Clearing Stations of the 3d – 85th and 88th Infantry Divisions (Valmontone region and Alban Hills). Litter carrries remained long and difficult because most of the terrain was inaccessible to heavy ambulances and even proved difficult for jeeps. Considering the heavy patient load and the fact that Field Hospitals often operated beyond their authorized capacity they were frequently unable to evacuate their patients in time to move further with the Divisions they supported. The only solution was to set up holding sections which were then left behind allowing the main body of the unit to advance. Additional ANC personnel and extra men and equipment were therefore borrowed from non-operational units. On 2 June 1944, the First Hospitalization Unit of the 11th Field Hospital was therefore attached to the 10th in the II Corps sector, in order to help carry the patient load. During the drive for Rome, the rolling plains northwest of the city favored the Allied advance with the Clearing Stations and their attached Field Hospital Platoons experiencing great difficulty in keeping up with the troops. Even with frequent moves it was impossible for the hospitals to avoid long ambulance runs as combat elements frequently outran ambulance control points and Aid Stations. During June 1944, Field Hospitals were given each 6 2½-ton trucks, eventually increasing to 10 trucks, but this measure remained insufficient to move personnel and supplies. The 10th Field Hospital remained in support of the 85th and 88th Infantry Divisions until relief of II Corps was completed on 11 June. After the capture of Rome (4 June 1944 –ed), the rate of advance somewhat slowed down owing to the withdrawal of substantial forces for the planned Invasion of Southern France. A new series of moves took place in the middle of July and early August, when the 11th – 93d – and 95th Evacuation Hospitals were withdrawn from Fifth US Army control. Also the 10th Field Hospital followed when it transferred to stage for the Invasion. August 1944, Southern France. Group of ANC Officers of the 10th Field Hospital (400-bed capacity) pose in front of a 1/4-ton truck. The First and Third Hospitalization Units (attached to Alpha Attack Force) landed around 1600 hours, 15 August 1944, at Pampelonne and Cavalaire-sur-Mer respectively. The Second Hospitalization Unit (attached to Delta Attack Force) landed about noon, 15 August 1944, at St. Tropez. On 1 August 1944, Headquarters – First and Third Hospitalization Units were located at a staging area 5 miles northwest of Pozzuoli, Italy, having been attached to the 3d Infantry Division TF; while Second Platoon was attached to the 45th Infantry Division TF together with 1 Platoon from the 11th Field Hospital, bivouacking some 10 miles northwest of Pozzuoli. Previous to this move all equipment had been checked for completeness as well as serviceability and requisitions submitted covering shortages. All equipment was loaded on 17 2 ½-ton cargo trucks and another 17 2½-ton amphibious trucks. Two (2) command & reconnaissance trucks and 4 ¾-ton ambulances were left behind for a follow up. Only absolutely essential housekeeping equipment was available after 19 July since virtually all equipment was loaded on vehicles and in turn on Liberty Ships at that time. In order to provide extra surgical treatment for battle casualties, 14 Surgical Teams were attached, including 7 general surgical teams, 1 thoracic surgical team, 1 neuro-surgical team, 1 orthopedic team, 2 maxillo-facial teams, and 2 shock teams. All surgical equipment of these teams was loaded on a ¾-ton weapon carrier. The plan issued for Operation “Dragoon”, which was to take place on 15 August 1944, contemplated the use of the 10th Field Hospital as a kind of forward surgical unit operating adjacent to the Division Clearing Station, with instructions to accept and treat only non-transportable casualties. 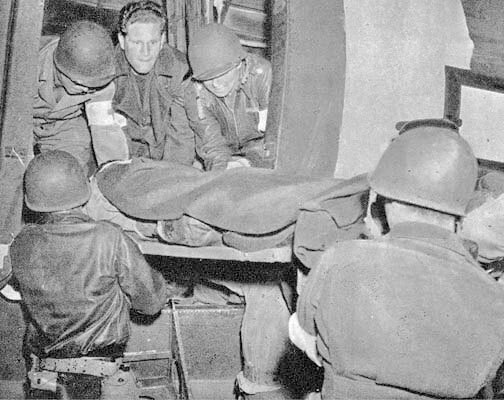 All equipment essential to establish and operate a 50-bed hospital was packed on 4 2½-ton trucks by each Platoon, and subsequently loaded on LSTs, available on call. Additionally, 18 Surgical Technicians from the 27th – 51st – 59th Evacuation Hospitals were attached prior to 1 August to assist in the care of patients as it was not contemplated to land Nurses with the initial assault wave. Furthermore, the 6703d Blood Transfusion Unit was also attached to accompany the unit on the operation. On 7 August 1944, all Nurses under the command of Captain Edith M. Swaney, ANC, joined the ANC Officers of the 95th Evacuation Hospital at the Nurses Staging Area in Naples, Italy (they would accompany them to France aboard the USAHS Marigold –ed). In the morning of 8 August the troops pertaining to Headquarters, First, and Third Hospitalization Units entrucked from the staging area and continued driving to the docks in Naples where they boarded seven different ships. Personnel of the unit had been provided reserve rations, entrenching tools, and many other items deemed necessary. Captain Garnet S. Aspnes and 12 Enlisted Men were left behind as the holding unit to follow the main organization at a later date. The Second Hospitalization Unit commanded by Major Ralph J. Plyler (10th Field Hospital CO –ed) embarked on 2 Liberty Ships 9 August. The Nurses serving with Second Platoon had been previously attached to the 93d Evacuation Hospital for the operation. The many ships were anchored near Naples harbor until 13 August 1944 when most of the convoy set sail. Following assignment of medical personnel to Operation “Dragoon” in 4 different Task Forces, 1 airborne and 3 naval groups, the latter group built around the 3d Infantry – 45th Infantry – 36th Infantry Divisions trained with their supporting units. The “Alpha Force” comprising the First and Third Hospitalization Units, 10th Field Hospital, the Forward Section, 6703d Blood Transfusion Unit (Overhead), the 95th Evacuation Hospital, and 10 teams of the 2d Auxiliary Surgical Group, all trained at Pozzuoli, Italy. The “Delta” and “Camel Force” were sent to Salerno for training. The organization’s Second Hospitalization Unit was part of “Delta Force” supporting the 45th Infantry Division. Preparations for debarkation were started at once. Headquarters debarked at 1000 hours on D + 1, at Yellow Beach #261, south of Saint-Tropez, where its CO contacted the other 2 Hospitalization Units. Part of the 2½-ton dukws were located which contained the Headquarters equipment and following this find, the section then moved to set up at Cogolin on D + 2. No casualties were suffered during this process, only a trailer with a generator and a water trailer were lost. 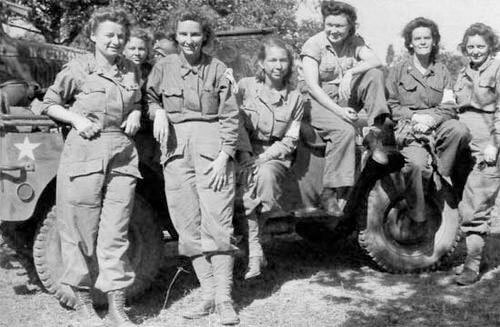 The Nurses, under command of Captain Edith M. Swaney including the ANC Officers belonging to the 2d Auxiliary Surgical Group attached to the unit joined 10th Field Hospital Headquarters at Cogolin, on 19 August 1944. From there on the Nurses joined their respective Platoons as soon as possible. Headquarters eventually moved from Cogolin to Saint-Maximin on 21 and 22 August. The First Hospitalization Unit, commanded by Major William M. Kennedy debarked around 1500 hours on D-Day, and established a hospital at Yellow Beach #261, some four miles south of Saint-Tropez, S. France. Three (3) men received minor injuries caused by the explosion of an Italian mine (Captain Eugene J. Sodaro, Technician 3d Grade Michael J. Mahedy, Private Alden J. Bird, First Platoon, 10th Field Hospital –ed). First Platoon then moved to and bivouacked at Cogolin on 17 August. The next day it already moved on to Gonfaron some twenty miles inland. On 22 August it left Gonfaron for a new site some four miles southeast of Aix-en-Province. The Second Hospitalization Unit, commanded by Major Ralph J. Plyler debarked at approximately 1130 hours on D-Day, at Beaches #262A and #263, near Sainte-Maxime, S. France. They suffered no casualties. The unit established a hospital on 17 August at Le Plan-de-la-Tour and immediately received patients from the 45th Infantry Division waiting to be operated. Second Platoon later moved on to Vidauban, 18 August, and Sillans-la-Cascade, on 19 August 1944 where it recovered its lost X-Ray equipment. New orders were received to move to Barjols, but before the Hospital was completely set up at this new site, it was torn down and moved to Saint-Martin-de-Pallières where it was established in a new location. Second Platoon went searching for their missing truck and trailer on 20 August but returned empty handed. In the end the driver was located but part of the equipment was missing. The Third Hospitalization Unit, commanded by Major Gerald A. Beatty debarked at about 1500 hours on D-Day and set up a hospital at Red Beach #259, north of Cavalaire, S. France. No casualties occurred. The Unit’s Commanding Officer, Lt. Colonel Earl B. Ross, also landed with this unit. The Platoon moved from its location near the beach on 20 August and bivouacked at Gonfaron, overnight, from where it proceeded by motor convoy to Saint-Maximin to establish a hospital by 21 August 1944. On 23 August 1944, the organization moved by motor convoy from Saint-Maximin to an area four miles north of Serres, where it was joined by Second Platoon one day later. October 1944, France. Partial view illustrating a ward of the 10th Field Hospital in full operation. During the very first day of the landings, casualties were evacuated from the Beach Clearing Stations by small landing craft to the transports and carried by LST to Ajaccio, Corsica, where they were received at the 40th Station Hospital for treatment. Any serious cases were sent on to Naples, Italy, by air. Hospital Ships then gradually took over discharging patients at Naples, Italy. Air evacuation was handled by the 802d and 807th MAETS, with flights being organized to Naples and occasionally other USAAF bases in Italy. Between 15 and 18 August 1944, 2257 Army casualties were received at the many Seventh US Army medical installations for urgent treatment (12 died in hospital), and 1667 US Army casualties were evacuated to ComZ units. Around the second half of August 1944, Headquarters, together with the First, Second, and Third Hospitalization Units, 10th Field Hospital were officially released from attachment to the 45th and 36th Infantry Divisions and attached for tactical purposes to VI Corps. On 27 August 1944, 6 Enlisted Men on TDY from the 51st Evacuation Hospital were returned to their parent unit. During the last week of August, the 10th units at Serres admitted 201 medical cases and 64 battle casualties. On 30 August, 6 EM on temporary duty from the 59th Evacuation Hospital were relieved from assignment and returned to their unit. All moves during the month of August were made with the unit’s organic transportation (total of 9 2½-ton trucks) and 4 2½-ton trucks attached with teams of the 2d Auxiliary Surgical Group. On 5 September 1944, 6 EM from the 27th Evacuation Hospital on TDY with the 10th Field were returned to their parent unit. On 28 September 1944, 6 Nurses were placed on TDY from the 36th General Hospital. The attached Surgical Teams were shifted from one Hospitalization Unit to the next and from Hospital to Hospital during August of 1944, and there was an average of 11 teams present. On 2 October 1944, 9 Enlisted Men were attached from the 56th Medical Battalion to supplement the personnel working on wards as a result of the seriousness of the casualties received. On 20 October 1944, after its move to Padoux, Third platoon experienced such bad weather that wooden floors were used in the wards at this location. The mud was ankle deep in the area and made movement almost impossible. Engineers were called in to help and constructed wooden floors; 8 sections per ward tent, and 4 sections per pyramidal tent. The floors were of great value both to patients and personnel. The 9 EM on TDY from the 56th Medical Battalion returned to their unit on 23 October, and were replaced by 9 other EM from the 52d Medical Battalion. It was at Remiremont (while all units were located there) that the 10th Field Hospital was re-organized under T/O & E 8-510 dated 31 August 1944, effective 26 October 1944, as per General Orders #95, Headquarters Seventh United States Army, dated 22 October 1944. At this date, the unit comprised 41 Officers (assigned) and 6 Officers (attached); plus 177 Enlisted Men (assigned) and 9 EM (attached). On 1 November 1944 the 10th Field Hospital was officially transferred from NATOUSA jurisdiction to ETOUSA control, operating under T/O & E 8-510, dated 31 August 1944, as per PAC Cable FX 45125, Headquarters NATOUSA, dated 28 October 1944. On 11 November 1944, 6 Nurses on TDY from the 36th General Hospital left and were replaced by 6 other Nurses pertaining to the 9th – 11th – 27th – and 51st Evacuation Hospitals to supplement the unit’s own personnel. On 12 November the Nurses were already released from attachment and returned to their parent unit. They were replaced by 15 new ANC Officers from the 132d Evacuation Hospital. On 14 November 1944 the 10th Field Hospital was relieved from attached service to VI Corps and reverted to full Seventh US Army control. It was subsequently assigned another sector of the combat zone to support the 3d and the 100th Infantry Divisions. The organization briefly provided medical support to the French Deuxième Division Blindée (French Second Armored Division –ed), for about five days. Due to the limited number of vehicles it was necessary to shuttle trucks in some instances. During the month an average of 12 surgical teams were attached to the Hospital. More opportunities developed to house the organization in either civilian buildings or hospitals which had its advantages during winter. The main support now went to the 79th Infantry Division. When Second Platoon set up in civilian hospital buildings at Stephansfeld, they were tasked with the continuation of treatment on approximately 22 patients transferred from the 54th Field Hospital which had been relieved by the Second Hospitalization Unit of the 10th Field Hospital. The 15 ANC Officers previously attached to the Hospital were returned to the 132d Evacuation Hospital on 9 December. Headquarters moved to Obernai and settled in more comfortable German Army barracks on 10 December 1944. On 22 December 1944, verbal instructions were received from the Surgeon, Seventh United States Army, ordering the 10th Field to support a different sector of the front, making it necessary to move all units. Additional transportation was made available in the form of 10 heavy trucks with trailers which were received on loan from the 117th Evacuation Hospital since it was contemplated to move 2 Platoons the following day. While setting up in Sarralbe, the Second Hospitalization Unit found an abandoned chemical plant which they used for their installations. They were intended to support the 44th Infantry Division present in the sector. On Christmas Day 6 Nurses were placed on TDY from the 237th General Hospital. The Third Hospitalization was meanwhile instructed to provide medical care to the 103d Infantry Division. During the month of December 1944, the 10th Field Hospital served at various times, many different Divisions, such as the 3d – 44th – 79th – and 103d Infantry Divisions, as well as elements of the French Second Armored Division. With Christmas and New Year close by, 4 Nurses and 4 Enlisted Men were authorized to visit Paris. On 2 January 1945, 9 EM from the 52d Medical Battalion returned to their unit. They were replaced by 9 new Enlisted Men on TDY from the 391st Medical Collecting Company but were already returned to their parent unit on 4 January. With the New Year came a number of promotions. Five (5) Nurses were promoted to First Lieutenant on 5 January 1945, including 1 MAC Officer. Some first transfers took place and 1 new Medical Administrative Officer was assigned and joined the unit on 26 January. As from January 1945, the organization operated in support of the 44th – 70th and 103d Infantry Divisions. Only 4 to 6 surgical teams were attached during December, they were supplemented by 2 French teams who were in fact attached for observation of surgery procedures in a Field Hospital. Captain Anthony M. Sarno, MC, was awarded the Bronze Star Medal for meritorious service in direct support of combat operations from 11 May 1944 to 12 June 1944 in Italy, by the Commanding General, 3d Infantry Division. The BSM was presented at Oermingen, France, by the CO of the 10th Field Hospital on 1 February 1945. On 1 February 1945, another Officer received his promotion to First Lieutenant, and on 11 February, a group of 47 Enlisted Men received a well-deserved promotion. A new Officer joined the 10th from the 235th General Hospital. Medical operations in France. Left: Field bivouac setup somewhere inland, France. Center: Nurses place a plaster of Paris cast on a patient’s arm. Right: Partial view of post-operative ward at Grandvilliers, end October 1944. Staff Sergeant James E. Muraco, was awarded the Legion of Merit for exceptionally meritorious conduct in performing outstanding services in the Sicilian, Italian, and Southern France Campaigns from 14 July 1943 to 31 October 1944. The medal was presented at Morhange, France, by the Commanding Officer of the 10th Field Hospital on 9 February 1945. One Officer was transferred to the 467th Dental Prosthetic Detachment, Mobile, on 15 February 1945, which was attached to the organization for supply, administration, and operations. On 16 February 6 ANC Officers received a promotion to First Lieutenant. On 21 February 1945, Captain Joseph B. Buckley (returned 17 March 1945) and Captain Adrian W. Craig (returned 15 March 1945) were placed on TDY with XV Corps to conduct dental inspections and correct oral defects of combat soldiers. Captain David I. Frank was transferred to the 235th General Hospital leaving the organization 24 February. The 10th Field Hospital was awarded the “Meritorious Service Unit Plaque” for outstanding devotion to duty in the performance of exceptionally difficult tasks from 16 August 1944 to 30 November 1944 in France, by General Orders #54, Headquarters, Seventh United States Army, dated 16 February 1945. (the award ceremony took place at Dieuze, France, in the presence of Colonel Myron P. Rudolph, Seventh US Army Surgeon, for the Commanding General, on Monday 26 February 1945). On 28 February 1945, Major General Louis E. Hibbs, Commanding General, 63d Infantry Division, visited First Platoon and awarded the Silver Star to an Officer, patient of that unit, for gallantry in action. It must be noted that all 3 Hospitalization Units were very active during the month serving the 44th – 63d – and 70th Infantry Divisions. The 70th Infantry Division became very active after the middle of the month and as result Third Platoon treated 147 battle casualties during March. Additional personnel, both ANC Officers and Enlisted Men, were provided to supplement the unit’s assigned personnel. There were 63 seriously wounded non-transportable casualties that received treatment at once on two occasions, causing momentary peak loads for the unit concerned. The First Hospitalization Unit treated 68 cases while operating in support of the 63d Infantry Division, and provided special treatment to 37 patients. Second Platoon continued operating in support of the 44th Infantry Division, and except for occasional flare-ups had little activity. It only treated 23 casualties and provided special treatment to 15 other patients during this period. Organic transportation was utilized during the frequent moves, except that extra vehicles were secured from the 93d Evacuation Hospital to move First Platoon from Dieuze to Sarralbe, France, the first half of the month. In March, new engines were installed in a number of vehicles and 6000-mile inspections completed on all. Since 10th Field Hospital Headquarters was necessarily located some distance from its Hospitalization Units, the supply problem became increasingly important. A regular messenger was dispatched to and from Headquarters to the Platoons daily with medical supplies, clean laundry, and other items as required. Twelve (12) ANC and male Officers received authorization to visit Paris during the month. There was no allotment for EM this month. Four (4) ANC Officers were placed on temporary duty with the organization from the 59th Evacuation Hospital on 2 March 1945. A new Officer, Captain Rudolph E. Christiansen was assigned and joined the 10th on 3 March. Personnel from the 64th Field Hospital visited the Hospital for purposes of receiving parallel training in the actual operation of a Field Hospital on 6 March and for approximately two more weeks thereafter. One Platoon of this unit was attached for operational control and great efforts were made to fully supply and equip this unit for immediate operation. Captain Eugene J. Sodaro was transferred to the 112th Evacuation Hospital and departed the unit on 6 March 1945. Partial view of the post-operative ward of the 10th Field Hospital, somewhere in France or Germany early 1945. Lt. Colonel Earl B. Ross was awarded the Bronze Star Medal for meritorious service in direct support of combat operations from 15 August 1944 to 31 December 1944. The medal was presented by the Chief of Staff, Seventh United States Army, on 7 March 1945, at Lunéville, France. A dental clinic was established at Headquarters after 17 March. The 4 Nurses from the 59th Evacuation Hospital returned to their unit. During the month of March 1945, the 10th Field Hospital entered Germany, enemy country! On 19 March 1945, the Second Hospitalization Unit moved to the vicinity of Blei Dalheim, Germany, and was the FIRST Seventh US Army Hospital to operate in Germany. On 20 March, 4 Nurses were once more placed on TDY from the 27th Evacuation Hospital. Eighteen (18) Enlisted Men, were attached and joined the same day from the 56th Medical Battalion to supplement the command’s own personnel. The Third Hospitalization Unit became the FIRST Seventh US Army Hospital to cross the Rhine River, doing so on 27 March 1945, and setting up at Alsbach, Germany. It was closely followed by the Second Hospitalization Unit which also crossed the Rhine the same day, establishing its hospital just south of Bensheim, Germany. The First Hospitalization Unit crossed the Rhine on 28 March 1945 and established its hospital at Lampertheim on 28 March 1945. The following day, the attached Platoon, 64th Field Hospital crossed the Rhine River and bivouacked with the 63d Infantry Division in the vicinity of Burstadt, Germany. The last group to cross the Rhine was Headquarters which crossed on 30 March and directly moved to the vicinity of Reichelsheim, Germany. Six (6) Nurses were placed on TDY with the unit from the 118th Evacuation Hospital on 29 March 1945. All 10th Field Hospital units were now actively engaged both prior and subsequent to the all-out Allied offensive launched in March. First Platoon medically supported the 44th and 63d Infantry Divisions; Second Platoon operated in support of the 3d and 45th Infantry Divisions; while Third Platoon supported the 45th and 70th Infantry Divisions. Casualties admitted during March of 1945 numbered 153 (First Platoon), 76 (Second Platoon), 190 (Third Platoon) and 34 (attached 64th Field Hospital Platoon). Following the breakthrough of the Siegfried Line defenses by Seventh United States Army troops, transportation became most difficult to obtain, causing important problems. By the middle of the month, 5 trucks had been attached upon instructions of the Surgeon, Seventh US Army. Twelve (12) more trucks were borrowed from the 118th Evacuation Hospital for three days (26-29 March 1945), and 11 trucks were received from the 112th and 127th Evacuation Hospitals for four days (27-31 March 1945). This was in addition to the 9 2½-ton trucks authorized the organization. The rapid movement of the forward elements and the problems of securing transportation clearly demonstrated the inadequacy of the authorized unit transportation for such situations. 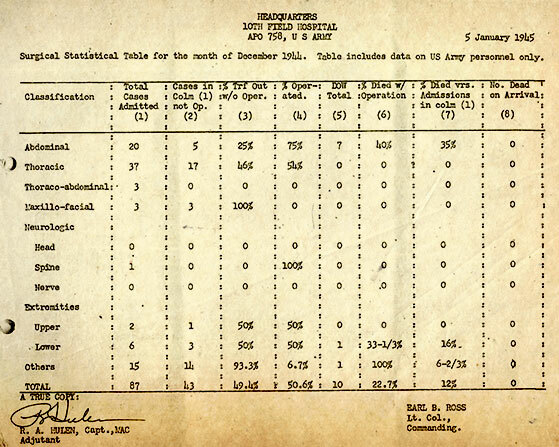 Copy of vintage document, dated 5 January 1945, showing some surgical statistics of the 10th Field Hospital for the month of December 1944. Eight (8) Enlisted Men and 1 Medical Officer were authorized to visit Paris in March, while 2 ANC Officers received 7-day leaves in Great Britain. The 8 ANC Officers on TDY were returned to their parent unit. First Lieutenant Helen G. Jefrrey and Technician 5th Grade Jake Whitten were returned to the Zone of Interior for 45 days rest and recuperation. Another 6 Nurses returned to duty with the 118th Evacuation Hospital on 4 April. Four (4) more ANC Officers from the 127th Evacuation Hospital were attached and joined on temporary duty 16 April 1945. On 30 April 2 of the Nurses on TDY with the 10th were released, while 8 EM were attached from the 56th Medical Battalion. It must be underlined that the Hospital was very active while supporting XV Corps throughout the campaign. The First Hospitalization Unit, supporting the 44th and 45th Infantry Divisions, treated 124 casualties in April; the Second Hospitalization Unit, supporting the 3d and 45th Infantry Divisions, provided treatment for 117 casualties; and the Third Hospitalization Unit, supporting the 3d and 45th Infantry Divisions, provided medical care to 106 casualties in the same month. As may be seen in the above, the Platoons were leapfrogged when they became inactive as a result of either leaving holding groups behind or in the event that large volumes of casualties were received. The attached Platoon, 64th Field Hospital was relieved from attachment during the first part of the month. Overall transportation temporarily consisted of 14 2½-ton trucks (including 5 attached) and divisional Medical Battalions often aided in moving the Platoons on several occasions. Supplies proved adequate though lines were long and difficult to traverse as a result of blown bridges and damaged roads. Separate laundry units were generally located some distance away, but service in general was good. Replacement was obtained on some salvage tentage during April. Eight (8) Enlisted Men and 2 Officers received authorization to visit Paris. The foreseen allotment for Nurses was cancelled due to a shortage of nursing personnel. On 8 May 1945, 26 EM on TDY returned to their parent unit. Two (2) ANC Nurses on TDY were returned to the 27th Evacuation Hospital. First Lieutenant Elenora E. Parker was transferred to the Detachment of Patients, Seventh United States Army on 11 May 1945. The entire 10th Field Hospital finally went into bivouac at Feldweis, Germany (starting 9 May 1945), the hospital plant being closed. In this period equipment and supplies were being thoroughly checked, inventoried and surpluses determined, as well as those items requiring repair and/or salvage. During the first part of May 1945, the 10th supported the 42d – 45th – and the 86th Infantry Divisions. While located at Feldweis and in bivouac, the unit did not establish a hospital. An extensive recreational program was organized in the area. The Chiemsee, being close by, provided ample opportunity for boating and swimming. Sightseeing tours were conducted to various places of interest and movies shown on a regular basis. Athletic contests also took place, they not only provided recreation but helped keep personnel in shape. Another move took place and between 17 and 19 May 1945 the entire unit moved to an area two miles south of Berg, Germany. Again, no hospital was established. On 24 May 1945, Major Gerald A. Beatty was transferred to the Detachment of Patients, Seventh US Army. Once more, movement took place, with the entire organization entrucking for Starnberg, Germany. This movement, involving all 10th Field Hospital units took place between 24 and 26 May. Upon arrival a number of houses were requisitioned for personnel and a vacant lot of buildings was used to set up a 100-bed hospital. The Hospital opened on 27 May 1945 and closed on 2 June 1945 at this location. The 10th remained more or less inactive during the latter part of May from a professional standpoint. An effort was made to allow the men and women as much rest and relaxation as possible. On 28 May 1945, 30 Enlisted Men were promoted within the unit. Eight (8) other Enlisted Men and 1 Officer received authorization to visit Paris, and 3 Nurses received passes and leaves. The unit ended the month of May 1945 with a strength of 36 Officers, 18 Nurses, and 179 Enlisted Men, all assigned personnel. We unfortunately were unable to find any material about the further whereabouts of the 10th Field Hospital and its final operations while serving in Germany. 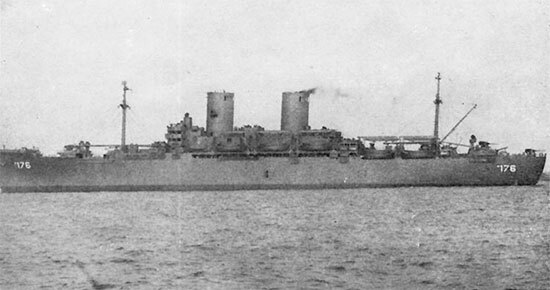 However, we do know that the unit definitely returned to the Zone of Interior for inactivation, which most probably took place as follows: Departure from Le Havre, France, 28 October 1945 with the USS General J. C. Breckinridge, AP-176, with destination Boston, Massachusetts, where she arrived 4 November 1945. The Hospital was subsequently inactivated at Camp Myles Standish, Massachusetts, the same day. As indicated in the Introduction, the Hospital was re-activated 25 October 1949 for duty in Germany. Picture of the USS General J. C. Breckinridge, AP-176. She carried the 10th Field Hospital back to the Zone of Interior on 28 October 1945. (as per T/O & E 8-510 dated 28 September 1943, and corrected 10 July 1944, a Field Hospital was to comprise 22 Officers – 18 Nurses – 190 Enlisted Men –ed). (During WWII the organization served in Tunisia, Sicily, Italy, France, and Germany –ed). Special thanks are due to Richard V. Horrell, WW2 Connections, who kindly provided the MRC with the shipping data for the 10th Field Hospital’s return, to the ZI. The MRC staff are still looking for additional information regarding Training in the Zone of Interior, late war operations, and a complete Personnel Roster of the organization. Any inputs appreciated. This page was printed from the WW2 US Medical Research Centre on 26th April 2019 at 02:50.